That is very typical for a German Shepherd puppy of this age. 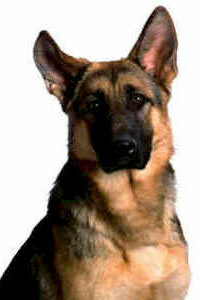 Very often a GSD puppy even up until he/she is about 18 months or older will look thin. German Shepherd puppies are still puppies until they are about 2 years old for girls and about 3 years old for boys - even though they often look like adults, they're not. Once they truly achieve adulthood they will "fill out" and add on some weight to give them that full adult look. Now with that said, just because your GSD puppy looks thin doesn't necessarily mean it's time to pack on the food. If I were you and you were unclear I would make an appointment at my veterinarian for a thorough checkup just to make sure your puppy is in the best health possible. Maybe you do need to add more food or more meal times to the puppies schedule, but maybe your puppy is wormy and not getting all the nutrients it needs, or it may be something else all together. A veterinarian visit can settle these worries and doubts easily. Then you'll know what to do. Overall it is much better to have your German Shepherd puppy a little on the thin side (not anorexic looking or really bony), than too heavy anyway. It is better on their developing joints, etc., etc. So go get your puppy checked out just to make sure everything is okay and then ask your vet for suggestions on what you should or shouldn't do concerning your developing puppies weight. Good luck!